March moves from hot to cold, from bareness of the landscape to deep green, from life to thoughts of death. March takes another life, someone a decade younger. Someone who has published my work on four occasions. I wonder again how life can be moving along and then just stop. Click. Off. In the middle of projects, people depending on you, work undone, and yet the body fails anyway, it doesn’t matter in the end. The body is not enough. It can’t hold together. Someone else is left with all those juggling balls in motion, left to catch them and put them away. Left to question why their loved one was taken — here, then gone. March moves on, closing out one day, pushing into the next, fighting to get to the end. Sun, rain, more rain than sun. The end comes hard this year. Because the last day marks the fifth anniversary of my father’s death. And it brings everything to the table again. Loss. Too much of it. The three people most important to my world’s foundation. Jobs. Identity. All gone. While I used to be enough, now I am not enough. I cannot do enough. I cannot be enough. The line between nothing and something is tight, and I try to balance on it, and I teeter. Because I am not enough, I will fall, and I know it. And so March moves on like a lion and it will go out like a lion, and I hear the roar and it is loud and all I can do is cover my ears and let it roar and let it take everything with it. 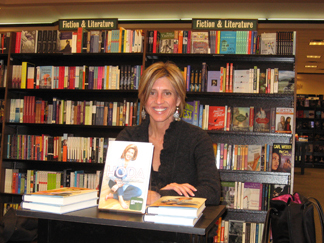 Jane Lorenzini became fast friends with Hoda Kotb when they worked in Ft. Meyers, Florida together early in their careers. So naturally Hoda wanted Jane to write her memoir: HODA, How I Survived War Zones, Bad Hair, Cancer, and Kathie Lee. Hoda is the cohost of Today and has also been a Dateline NBC correspondent since 1998. Jane is currently a freelance writer. She reported and anchored television news for 15 years. She has known Hoda for 20 years. Jane begins Hoda’s story by telling how in Greenville, Mississippi (my old stomping ground! ), an old black woman walked up to Hoda, cupped Hoda’s face in her hands, and asked, “What is you?” Hoda’s family is Egyptian. She shares about her family and her life story in this memoir, as told to Jane. And Jane even got a byline. And it’s a great book cover! I love it when I read something that stays with me. An image. Something unique and different, something I’ve never heard of or read about, but I absorb the words and my mind creates a visual and it becomes part of me and I smile every time I recall it and I want to experience it, too. That happened a few days ago, while I was reading Jeannette Walls’ Half Broke Horses. The family had just moved to a ranch in the Hondo Valley, south of the Capitan Mountains in New Mexico. “The next day, while we were unpacking, Dad hollered for us to come outside. I’d never heard him so excited. We ran out the door, and Dad was standing in the yard, pointing up at the sky. There, floating in the air above the horizon, was an upside-down town. You could see the low, flat stores, the adobe church, the horses tied to the hitching posts, and the people walking in the streets. We all stared slack-jawed, and Lupe made a sign of the cross. It wasn’t a miracle, Dad said, it was a mirage, a mirage of Tinnie, the town about six miles away. To me, the mirage seemed nothing short of a miracle. It was huge, taking up a big hunk of the sky, and I was mesmerized watching those upside-down people silently walking through those upside-down streets. Isn’t that nice? Just lovely. And I won’t ever forget that picture.